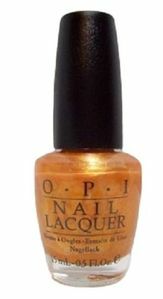 OPI Nail Polish, 18K Ginza Gold, NLJ08, .50 fl. oz. Semi-sheer, warm brassy gold nail color with subtle orange undertones and golden shimmer.